A serial murderer known only by a grotesquely apt nickname-Buffalo Bill-is stalking women. He has a purpose, but no one can fathom it, for the bodies are discovered in different states. Clarice Starling, a young trainee at the FBI Academy, is surprised to be summoned by Jack Crawford, chief of the Bureau's Behavioral Science section. Her assignment: to interview Dr. Hannibal Lecter-Hannibal the Cannibal-who is kept under close watch in the Baltimore State Hospital for the Criminally Insane. Dr. Lecter is a former psychiatrist with a grisly history, unusual tastes, and an intense curiosity about the darker corners of the mind. His intimate understanding of the killer and of Clarice herself form the core of The Silence of the Lambs-and ingenious, masterfully written book and an unforgettable classic of suspense fiction. 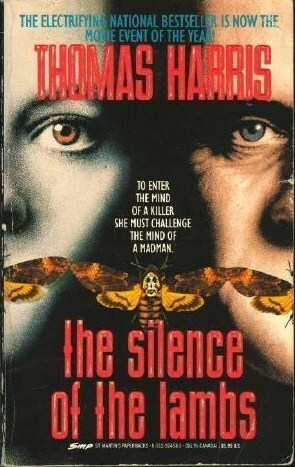 Another re-read of Silence of the Lambs, this time my favorite. Maybe it's because I'm more into the story and read them in the order of sequence and not popularity, I'm not sure, but this time around I found it even more fascinating than the first meet. Clarice is a likeable character. Her background melding with who she wants to be is an admirable one. She's given the chance of a lifetime, handed out by a man she admires, to step her foot firmly into the FBI. Without meaning to, she's sucked into the world of Hannibal Lecter, who spurs her on to uncover clues and solve the mystery of the serial killer the media calls Buffalo Bill. Her determination mixed with fragile ego was a realistic blend, and her internal backward insults when talking to people who don't give her enough credit was downright amusing. The character of Hannibal Lecter is larger than life, written so well on the pages I can see him clearly as the writer takes him through the motions. With class and culture, manners but enjoying cruelty with his words, the madman is interesting as he both torments Clarice and forces her to self-reveal. The heart of the book is their verbal warplay, the cautious pauses on her behalf, the strategic maneuvering on his. I'm surprised how much I felt for Crawford in this one; I think before he fell in the shadows and I didn't pay as much notice. He's an intriguing character from his haunting moments with his ailing wife, his detached involvement with Hannibal, to his almost paternal bond of Clarice. As a serial killer, Jame Gumb is twisted. Monstrous in mind and disgusting with actions, he absorbs just enough page time to be interesting but not enough to make it too much about him, to take the focus off the more fascinating areas of this book. And the escape with Hannibal is a tense, intelligently created one. With books like Hannibal Rising, I sometimes found Harris too dry and to the point, but here in Silence he shines, obviously having a lot of enthusiasm to make a multi-layered, psychologically twisted work - the combining of such different people already in various forms of power to those just coming into their own. I tried watching the movie again recently but turned it off after about 20 minutes. Too soon and I already missed some of the depth in dialogue the book held.